The Melpitz site is a rural background site located in Germany near the city of Torgau in the glacial valley of the river Elbe (12°56’E, 51°32’N, 86 m a.s.l.). 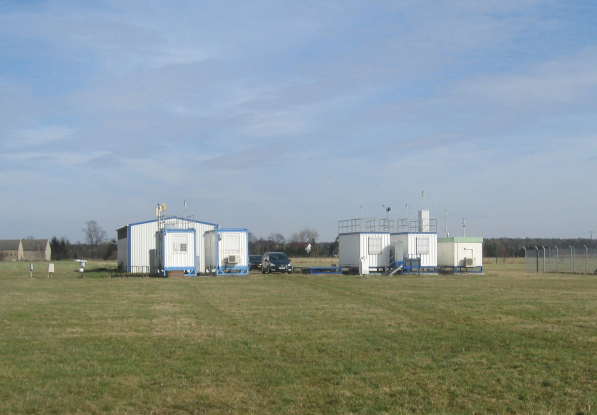 The research station Melpitz was operated by the Leibniz-Institute of Tropospheric Research (TROPOS), Leipzig. The site is integrated in EMEP (level 3, code DE44) in collaboration with the German Federal Environment Agency and a GAW regional station. The TROPOS Melpitz site is part of the European infrastructure network ACTRIS and of the German Aerosol-Network for ultrafine particles GUAN. The measuring field is situated on a flat meadow surrounded by agricultural land (Spindler et al. 2001; 2010 and 2013). Results of aerosol characterization from this station were compared with results from other stations in Europe (EMEP 2016, Hamed et al. 2010; Aas et al. 2012; Alastuey et al. 2016, Glasius et al. 2018) and used for estimating different sources in the surroundings with influence at the background concentrations (e.g. Herrmann et al. 2006; Gnauk et al. 2011, Mutzel et al. 2015; Stieger et al. 2018 and 2019). The dominating wind-direction sector for Melpitz is South-West and maritime air-masses reach the field after crossing a large area of the western part of middle Europe. The second main wind direction sector is East with mostly dry continental air masses influenced by long range transport from anthropogenic emissions in Poland, Belarus, Ukraine, Slovakia, and the Czech Republic arrive Melpitz. There are only very few local sources for anthropogenic emissions in direction East in Germany in close distance to the Polish border which is only about 130 km east of Melpitz. The Melpitz site is representative for a large rural area in Saxony (East and North-East German lowlands). The TROPOS Melpitz site was integrated in different local temporal networks for investigation of long range transport (e.g. projects “Aerosol 2013-2015”and “PM-Ost”) van Pinxteren et al. 2016 and 2019. The mean yearly mass concentration in 2017 for particles PM10 and PM2.5 were found to be 20.31 µg m-3 and 15.79 µg m-3, respectively. The mean PM2.5/PM10 ratio was 0.78. Such quite high PM2.5/PM10 ratios are typical for rural lowland sites in central Europe.